LI Cheng, GUO Tingting, XIAO Jun, FAN Shangchun, JIN Wei. Interference characteristics analysis of optical fiber Fabry-Perot cavity with graphene diaphragm[J]. Journal of Beijing University of Aeronautics and Astronsutics, 2015, 41(4): 574-579. Abstract:With regard to the design of optical fiber Fabry-Perot cavity using graphene as sensitive diaphragm, the deflection change under uniformly distributed loads in graphene film was analyzed by finite element method based on the large deflection elastic theory of circular film. The pressure-sensing mathematical model of optical fiber Fabry-Perot cavity with graphene diaphragm was established based on the working principle of Fabry-Perot interferometer. The effects of graphene film layer and incident light angle on the film reflectivity were obtained according to the refractive index characteristics of the film. 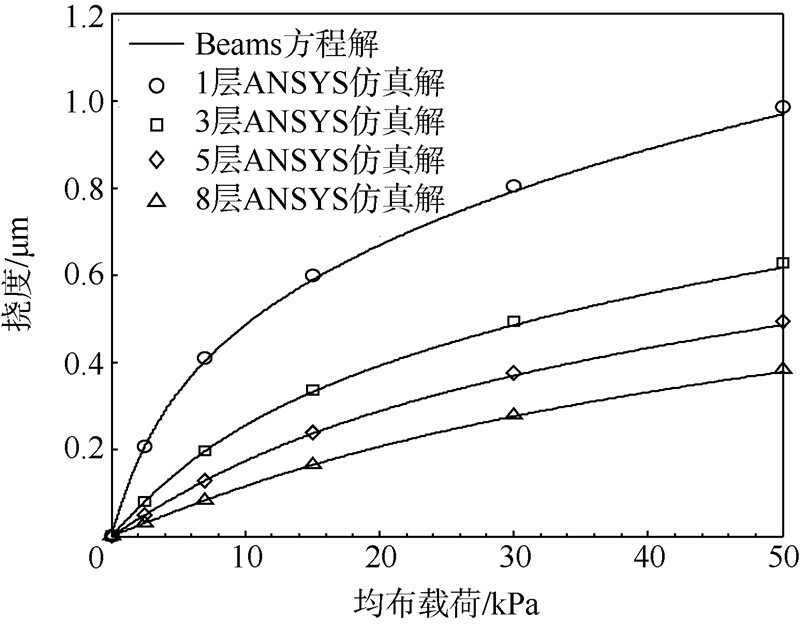 Then the interference spectra change, caused by both the cavity length losses and the film deflection deformations under the pressure loads, were analyzed. The simulation results show that adding the film layer can increase the film reflectivity and further improve the optical interference performance; however, a decreasing effect on the deflection deformation is caused by the film layer with the increase of pressure load. Thus, an 8 layer graphene film can achieve a reflectivity of 0.715% and an approximate theoretical sensitivity of 10 nm/kPa for a 40 μm Fabry-Perot cavity length with a membrane diameter of 25 μm. It provides a theoretical basis for the design and fabrication of high-sensitivity fiber-tip pressure sensor with multiple-layer graphene diaphragm. 2004年,英国曼彻斯特大学Novoselov和Geim等用微机械剥离方法首次获得了单层石墨烯薄膜.作为自然界中已知的最薄的膜材料,单层石墨烯的厚度为0.335 nm,其断裂强度为42 N/m,是不锈钢的100倍,弹性模量接近1 TPa,弹性延展率可达20%,其不透明度为(2.3±0.1)%,反射率小于0.1%;但不透明度随薄膜层数的增加而变大,梯度约为2.3%[2, 3, 4].随着石墨烯制备及转移方法的不断发展[5, 6],石墨烯薄膜优良的机械特性和光学特性受到了研究者的广泛关注.2008年,美国康奈尔大学Bunch等对石墨烯薄膜的不透气性进行了理论与实验研究,这为石墨烯材料用于压力传感器的敏感薄膜提供了可能.2012年,瑞典KTH皇家理工学院Smith等提出了悬浮石墨烯压力传感器的结构与制造工艺,并运用喇曼光谱仪对石墨烯的变形进行了分析,在13 978 Pa压力下单层石墨烯的最大变形可达280 nm.但所用SiO2与SiC基底的性质逊于石墨烯的内在性质,对传感器的结构与功能产生一定局限性.2013年,韩国世明大学Kwon等利用顶板结构借助压力传递效应,提出了一种改进的悬浮石墨烯压力传感器,其在低压范围内具有较好的线性度,但在高压范围内线性度较差,且结构尺寸相对于一般悬浮石墨烯压力传感器较大.2012年,香港理工大学Ma等以直径125 μm的石墨烯膜为感压元件制作了光纤F-P腔压力传感器,其灵敏度为1 100 nm/kPa[10, 11]. 式中,i为虚数单位;η1为石墨烯薄膜的有效导纳;η2为空气的有效导纳;薄膜厚度d=薄膜层数×单层膜厚;N1为石墨烯薄膜复折射率.对于p-偏振光,η1=N1/cos θ1,η2=1/cos θ2(空气折射率≈1),而对于s-偏振光,η1=N1cos θ1,η2=cos θ2,其中,θ1为空气界面与薄膜的折射角,θ2为薄膜与空气界面的出射角. 当石墨烯膜为9层以下时,其反射率低于1%.这表明在F-P腔内石墨烯膜的反射光强度很弱,入射光强几乎被透射或损耗.但随膜厚增加,其反射率随之单调变大.而且,以8层石墨烯膜为例,当波长为1 600 nm和1 550 nm时薄膜反射率分别为0.718 9%和0.715 4%,两者相差仅为0.003 5%.这样,当自由光谱范围FSR较小时可忽略入射光波长对反射率的影响. 仿真结果表明,随着薄膜变厚,入射光角度对薄膜反射率的影响逐渐显现,但并不明显.以8层石墨烯膜为例,当入射角度(θ0)为0°,3°,6°,9°时,薄膜反射率依次为0.715 4%,0.706 3%,0.679 8%,0.638 9%.这表明在F-P腔内石墨烯薄膜反射率随入射光角度的增加会发生小幅减小,但减小的趋势有限.因此,对于在内径25 μm的光纤凹槽以及125 μm陶瓷插芯内形成的微小F-P腔,因薄膜吸附变形而引起的入射光小角度变化对反射率的影响可忽略. 图 5为入射光波长为1 500,1 550,1 600 nm时F-P腔干涉光耦合曲线.由此可知,对于固定腔长,波长对F-P腔光强损耗的影响较弱.以L=40 μm为例,波长由1 500 nm变化至1 600 nm所引起的耦合系数仅差0.038 1.但腔长变化对光强损耗的影响更为明显.以λ=1 550 nm为例,当腔长大于50 μm时,耦合系数小于0.6,从而使干涉信号光强大幅损耗.为此,需选用小F-P腔以提高干涉光强信号的检测性能. 针对均布载荷对石墨烯膜光纤F-P腔信号检测的影响,结合获取的石墨烯膜机械力学特性(第1节)和光学反射特性(2.1~2.2节),以单层和8层的周边固支圆薄膜为例,取F-P初始腔长为40 μm,图 7为均布载荷下单层及8层石墨烯膜的F-P腔干涉光谱.由此可知,对周边固支的直径为25 μm的圆薄膜施加均布载荷,在1 520~1 590 nm范围内光纤信号表现为干涉光谱特征,且随着载荷以10 kPa为间隔由0递增至50 kPa,其腔长变化量ΔL及干涉光谱峰值对应的波长偏移量Δλ如表 1所示. 仿真结果表明,一方面,增加薄膜厚度将降低挠度变形及其干涉光谱峰值处波长的偏移量,但另一方面,随着薄膜层数的增加,石墨烯压力-位移特性曲线的曲率变小,使非线性得到相应改善,不过对压力的敏感程度则相对降低.特别地,对于所用40 μm腔长,单层石墨烯膜F-P腔的干涉对比度为0.128,其明显低于8层石墨烯膜的0.782.如将图 7中干涉信号光谱转化至对数域,则相对光强的峰-峰值分别约为1.12 dB和9.13 dB.考虑到光谱仪AQ6370C的0.1 dB/Div功率精度,双峰法可分辨出8层石墨烯膜的F-P干涉光谱,则由直径25 μm的石墨烯膜挠度特性,其理论压力灵敏度约为10 nm/kPa.而且,通过调整薄膜结构尺寸及薄膜与F-P腔基体的吸附性能可有效改善传感器灵敏度与干涉光谱信号提取. 3) 根据石墨烯膜的干涉对比度仿真分析,直径25 μm的8层石墨烯圆薄膜具有0.715%的反射率,当F-P腔长设计为40 μm时其可实现约为10 nm/kPa的理论压力灵敏度. Novoselov K S, Geim A K,Morozov S V,et al.Electric field effect in atomically thin carbon films[J].Science,2004,306(5696):666-669. Liang X, Sperling B A,Calizo I,et al.Toward clean and crackless transfer of graphene[J].ACS Nano,2011,5(11):9144-9153. Lee C, Wei X D,Kysar J W,et al.Measurement of the elastic properties and intrinsic strength of monolayer graphene[J].Science,2008,321(5887):385-388. Nair R R, Blake P,Grigorenko A N,et al.Fine structure constant defines visual transparency of graphene[J].Science,2008,320(5881):1308. 袁小亚. 石墨烯的制备研究进展[J].无机材料学报,2011,26(6):561-570. Yuan X Y.Progress in preparation of graphene[J].Journal of Inorganic Materials,2011,26(6):561-570(in Chinese). Martins L G P, Song Y,Zeng T,et al.Direct transfer of graphene onto flexible substrates[J].Proceedings of the National Academy of Sciences,2013,110(44): 17762-17767. Bunch J S, Verbridge S S,Alden J S,et al.Impermeable atomic membranes from graphene sheets[J].Nano Letters,2008,8(8):2458-2462. Smith A D, Vazirs S,Delin A,et al.Strain engineering in suspended graphene devices for pressure sensor application[C]//Proceedings of the 13th International Conference on Ultimate Integration on Silicon.Grenoble,France:IEEE,2012:21-24. Kwon O K, Lee J H,Kim K S,et al.Developing ultrasensitive pressure sensor based on graphene nanoribbon:molecular dynamics simulation[J].Physica E:Low-Dimensional Systems and Nanostructures,2013,47:6-11. Ma J,Jin W, Ho H L,et al.High-sensitivity fiber-tip pressure sensor with graphene diaphragm[J]. Optics Letters,2012,37(13): 2493-2495. Ma J, Xuan H F,Ho H L,et al.Fiber-optic Fabry-Perot acoustic sensor with multilayer graphene diaphragm[J].IEEE Photonics Technology Letters,2013,25(10):932-935. Beams J W. The structure and properties of thin film[M].New York:John Wiley and Sons,1959:183-190. Zhou X, Yu Q.Wide-range displacement sensor based on fiber-optic Fabry-Perot interferometer for subnanometer measurement[J].IEEE Sensors Journal,2011,11(7):1602-1606. 唐晋发,顾培夫. 薄膜光学与技术[M].北京:机械工业出版社,1989:5-24. Tang J F,Gu P F.Thin film optics and technology[M].Beijing:China Machine Press,1989:5-24(in Chinese). Nelson F J, Kamineni V K,Zhang T,et al.Optical properties of large-area polycrystalline chemical vapor deposited graphene by spectroscopic ellipsometry[J].Applied Physics Letters,2010,97(25):253110. Ma C, Dong B,Gong J,et al.Decoding the spectra of low-finesse extrinsic optical fiber Fabry-Perot interferometers[J].Optics Express,2011,19(24):23727-23742. Journal of Beijing University of Aeronautics and Astronsutics, 2015, 41(4): 574-579.